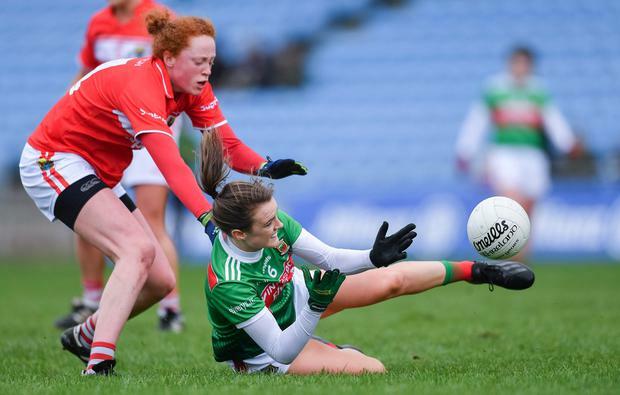 All-Ireland champions Dublin, runners-up Cork, Connacht champions Galway and Ulster queens Donegal will compete in this year's Lidl NFL semi-finals. Cork's 4-15 to 2-05 win over Mayo at MacHale Park means the top four teams cannot be caught and the final round of games in two weeks will decide the semi-final line-ups. Goals from Niamh Cotter, Doireann O'Sullivan, Orla Farmer and Rhona Ní Bhuachalla gave Cork the win in Castlebar. Emma Needham hit the net for Mayo, while Sinead Cafferky also goaled for the home side, but Cork finished with a flourish. "The second-half was more of a reflection of how we played, but we can't be waiting for 30 minutes to start performing," said Cork boss Ephie Fitzgerald. "I am delighted with the girls, the response from them was excellent. Doireann (O'Sullivan) got a great goal and that relaxed us, and from there we played really well." Donegal only needed a point to make it into the knockout stages, but Karen Guthrie ensured they claimed all three in Letterkenny with a six-point haul in a 1-08 to 1-04 win over Westmeath. "Tight matches are of more benefit to us," reflected Donegal boss Maxi Curran. "We have a lot of young girls who weren't used to such physically demanding games, but they're coming out the right side of it now." Westmeath cannot now be relegated after Tipperary did them a favour and defeated Monaghan (1-15; 2-11) in Thurles. Even a win in a fortnight against Mayo cannot save the Farney girls at this stage. In Galway, Sinead Aherne and Siobhan Woods hit a goal in each half as Dublin ended Galway's unbeaten run with a four-point win in Moycullen (2-08; 1-07). In Division 2, Armagh's unbeaten record was ended by Kerry, who picked up a four-point win (3-16; 2-15) on the road thanks to two goals from Louise Ni Mhuireachtaigh. Clare inflicted a one-point loss on Tyrone (1-12; 1-11), which has given them a great chance of reaching the last four. Cavan had seven points to spare over Wexford (3-13; 2-09), while Waterford edged an eight-goal epic against Laois (4-13; 4-08) to maintain their promotion drive. In Division 4, Limerick claimed the win in Derry, Fermanagh put eight goals past Carlow, Leitrim beat Kilkenny to earn their first win, while Louth were handsome victors over Antrim.